Maxim Lott sees the slope of the line for the last 17 years as being virtually flat. I imagine that if he went for a run and came to a hill, he wouldn't even notice it. The NASA data he cites is here (which doesn't include any of the scorching 2015 data), and his article here. Sadly, his article is a cut above the normal Fox News piece in that it least includes, if buried somewhat down the piece, the statement by scientists that possibly-increased rain in Africa is outweighed by risks and costs of climate change. The article otherwise contains the mixed messages that the climate isn't changing, the climate is always changing naturally, and that the climate change we're causing is having beneficial effects. Fox News and Maxim Lott haven't quite figured out what the message is, but I doubt many Fox readers click on the link they're given to see if NASA actually says what's claimed. I emailed Lott last week about this. I assume he's very busy. And yes to the idly curious, he is John Lott's son, the "Ma" of Mary Rosh. That's not his fault, but this article is. 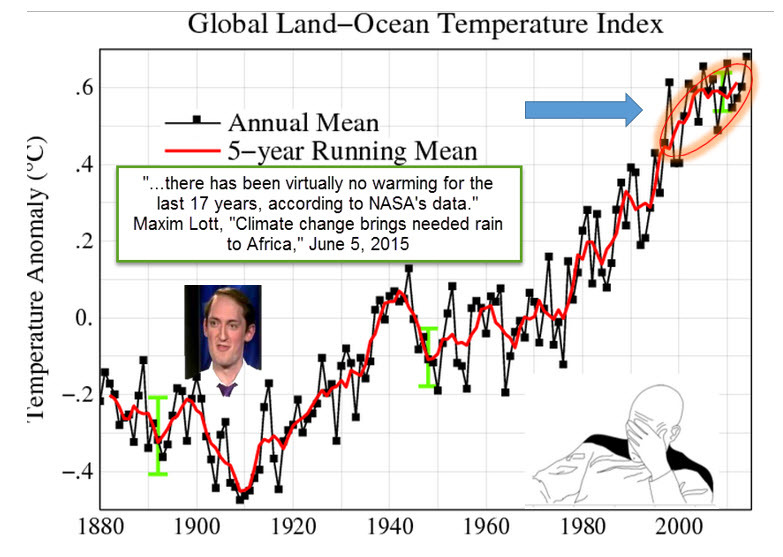 Climate Brief has a response on the Sahel claims--reposted at Skeptical Science.